Pile on the scoops for learning fun! Listen carefully for what color and how many scoops to stack next. 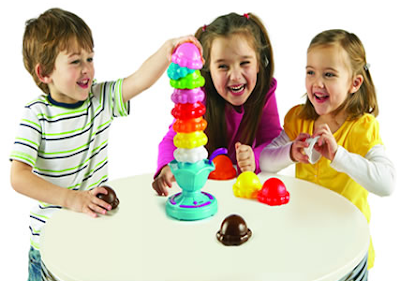 Reinforces color recognition, number sense, counting, motor skills (stacking), and social interaction. Scoops measure 2"L x 2"H.
The princess has been having a wonderful time learning her colors and numbers over the past few months, so I knew that she would love the Sky High Scoops Colorful Count & Stack Electronic Game. B was even excited to get into the game with us. The electronic "dish" base has three buttons, and the game instructs each player when it's there turn how many scoops (and in some cases which color) to add or take away from the dish. Because the rules of the game are fairly straight forward it is perfect for the princess. 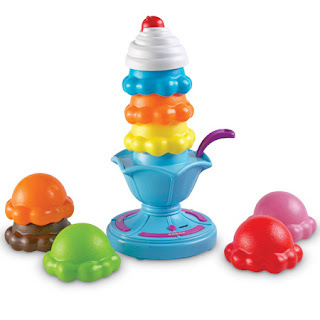 We all enjoyed playing this game together, and seeing how high we could stack the scoops and see who would be the first to add the cherry on top of the Sky High Scoops Sundae! As a mom I loved that this game was teaching while we played. Counting, adding, subtracting, color recognition, and following direction are all concepts that are taught while playing and having fun with the Sky High Scoops Colorful Count & Stack Electronic Game by Learning Resources! Sky High Scoops would make a great gift this Holiday Season! Fun & Educational! One Lucky Winner will receive Sky High Scoops Count & Stack Electronic Game! Leave a comment~ Visit http://www.learningresources.com/ and let me know another product that you would love to gift or receive this Holiday Season. The comment is considered your entry. 2) Tweet ~ #WIN Sky High Scoops Colorful Count & Stack Electronic Game @savvycouponmom http://bit.ly/gNT692 #GIVEAWAY #Holidays (can be repeated twice daily for additional entries~ copy paste please~cut and paste- the bit link must be posted in the tweet - I will check) (Additional 5 Entries - 5 Comments). I love the gingerbread shape sorter. I'd also love the Jumbo Jungle Animals for my son! following you publicly via GFC as Addison K.A.T. and I'd love to gift the Jump 'N' Jam Jungle Talking Floor Mat! I love the Melody Express Musical Train. I would like to get the Planet Quest™ Game as a gift. I know my lil' guy would love the Let's Pretend PlayBrix. I also entered your Zippo Candle Lighter giveaway!